What an amazing first meal to have in Dublin. I was seriously lacking sleep having just flown overnight into a european morning. 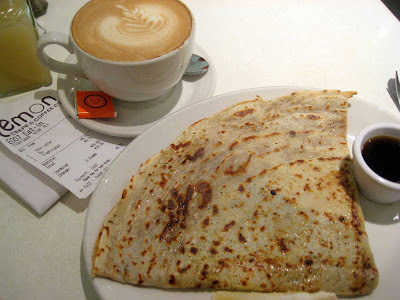 While roaming around the Grafton St area a bit, I happened upon Lemon Crepe & Coffee. I actually remembered the location of this place. I don’t necessarily remember the restaurant being this restaurant when I was last in Dublin (years ago now) but I definitely remember the corner it was on. And that whatever restaurant it may have been those many years ago, it was always busy and full of people. I was not only tired, but starving, so I gave this a go. I thought this place would be a safe bet. Good decision girl! I got the house special lemon crepe. It’s served with organic syrup and a lemon wedge. And I also got a latte. Yes, I needed to stay awake! I honestly don’t think much was in this crepe, if anything, but it doesn’t really matter, because it’s perfect. I haven’t had that many crepes in my life, but this was the best one yet, and it had no fillings of any kind. It was the batter that made it so good. I could eat this all the time. Just plain. It needs no accessories!!! Not that the syrup and lemon weren’t good on it, but it’s not necessary. And it’s big too! The latte was also excellent. He asked me if I wanted it strong or not, and I said not. I’m still in the process of acclimating myself to caffeine again. But it must have been not too strong, because I did just fine. This place is teeny tiny, and there are only a few spots inside and a few spots outside. Cash only folks, so bring your Euros!